Hot this week: A very famous Egyptian faces charges. It sure does. More Cuno stuff. This time a statue of Omar al-Mukhtar. Allegedly was transporting them in food packaging in his car. This is for the Khufu Pyramid artefact theft case. The three Germans were tried in absentia. Special treat, one of the Germans is described in press as an “experimental archaeologist”. Specifically that he was involved in the Khufu pyramid artefact theft. Three out of 18 suspects arrested for last year’s theft of 302 pieces from the State Museum of Painting and Sculpture. Police caught the group robbing a temple in Ajmer and the gang opened fire. One of the robbers was caught. The men were found to be stealing idols. There have been several idol thefts in the city in the last three years. The Culture Ministry of Bavaria says they won’t be able to stick to the time table set out to discover the heirs of the Gurlitt hoard. This 89-year-old heir to a painting in the Gurlitt hoard doesn’t have all day. Now if the Bern museums happened to want to NOT take the Gurlitt stuff, his relatives say that they would return the stuff to its rightful heirs. They ‘stole’ a memorial to those who died crossing from East to West Germany and placed it on the EU border. Which I think we can all agree is a pretty awesome thing and in the spirit of the original piece and the actions that it memorialized. Of course the government, never one to want to be criticized effectively via art, called it shameful. The collective hit the politicians with a defamation suit. Much like in other locations, sacred art theft is happening in Italy. I don’t think theft from churches gets enough press. Where I lament the loss of two archaeologically excavated pieces and suggest that whoever paid $21k for one should join the ranks of the St Louis AIA and Bonhams: folks who should be ashamed of themselves. And in the same auction, Mexico steps in to cast doubt on the authenticity of many of the pieces for sale. I too have my doubts about that stuff. Really, buying them is foolish on many levels. Antonio Benavides Castillo speaking about the above case. 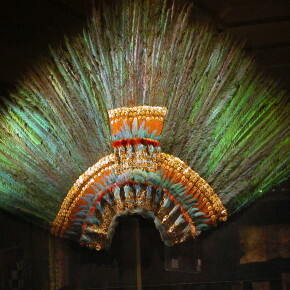 Where should ‘Montezuma’s headdress’ be? Probably not in a closed museum in Vienna. Even if you don’t read Spanish, translate this one. It is a good overview of what all is going on in Argentina. Good for the Burke Museum of Natural History and Culture. The issues with these items came up while inventorying Native American remains for NAGPRA compliance. The Museum found they had remains from Peru, decided to send those back, AND send artefacts back as well. Other museums: do this. Oh the poor Norton Simon, losing all its art. Perhaps Simon shouldn’t have, you know, not bought the spoils of a number of different genocides and this wouldn’t be happening. You’ll find I don’t have a lot of sympathy. Think illicit antiquities have to be ‘portable’? Think again. This stolen and smuggled cannon-like gun is huge. It was found on a ship in Boston. The man was obsessed with stealing a Strad. Of course people collect meteorite bits. In many jurisdictions this is illegal and in some, meteorites are regulated by the same laws as antiquities.